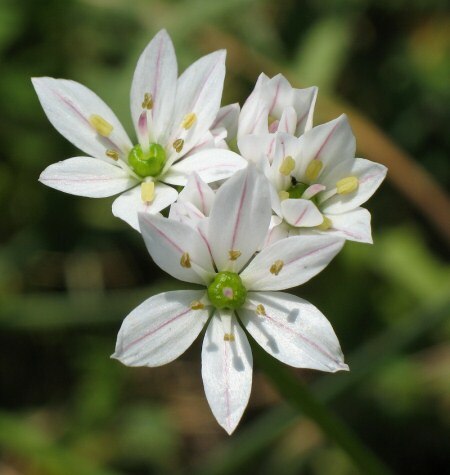 ﻿ Allium trifoliatum (Pink Garlic) : MaltaWildPlants.com - the online Flora of the Maltese Islands. Published in Pl. Rar. Neap. 2: 11 (1792). Basionym or principal synonym: Allium subhirsutum subsp. trifoliatum (Cirillo) Arcang. Rocky ground, fallow fields, and wasteground especially near fertile land. Bulbs up to 1·2 cm in diameter, subglobose; outer tunic membranous, not pitted. Stem 15-45 cm, terete. Leaves 2-3, 5-60 cm × 2-15 mm almost basal, linear, sparsely hairy. Spathe up to 2 cm, 1-valved persistent. Umbel 2·5-4 cm in diameter, fastigiate; pedicels up to 20 mm, 1½-3 times as long as perianth-segments. Perianth stellate; segments 7-10 mm, white, tinged with pink or with a pink vein, often reddening with age, lanceolate, acute. Stamens ½ as long as perianth; filaments 4-5 mm, subulate, simple; anthers yellowish. Capsule 4-5 mm.